All Socket AM4 boards supporting all Socket AM4 processors? Not for some manufacturers. One of the functions of a motherboard BIOS, or UEFI, is the ability to discern which CPU is installed in the socket. With each new generation of CPUs, new versions of BIOS firmware are launched such that the new processors can be detected and run. It is impossible to know in advance which CPUs are coming out 12-24 months in the future, so users need to update their BIOS before updating CPUs. 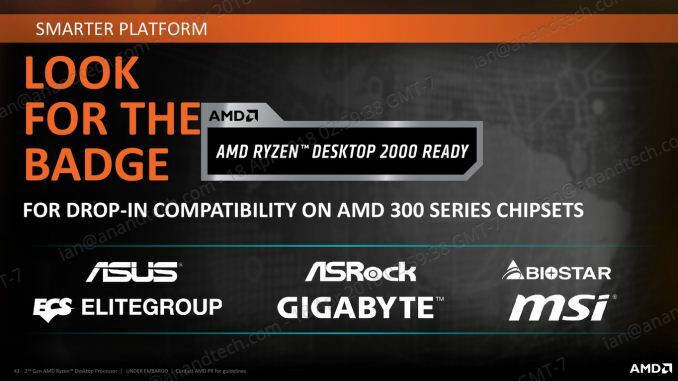 Users who have invested in AMD’s AM4 platform, pairing a Ryzen-2000 series CPU or APU with an early revision of the A320/B350/X370 motherboards might already be too familiar with this: buying a motherboard which should support the CPU on the latest BIOS, but the retailer has older stock which has not been updated. To solve this, AMD initiated a program whereby the company would send the user an early-series Bristol Ridge processor and cooler so the user could get the system to Boot, then the user can update the BIOS to use the new processor. Similar issues happen with Intel’s platforms as well, although they have been publicised less as Intel uses new sockets and chipsets more frequently. One of the advantages of updating sockets and chipsets more frequently is that the microcode required for previous generations of processors is not in the BIOS. By having a socket and platform that has a long life span, in order to support every processor, the BIOS has to contain all the microcode required for those processors. All of it. This can cause problems, such as the problems that some motherboard manufacturers are facing today. During Computex, several manufacturers told us one of two things: either they would be dropping support for Bristol Ridge processors on some systems, or they have had to increase the size of the BIOS chip in order to retain support. Most motherboards in the market use a single 128 Mb (mega-bit, 16 megabytes) BIOS chip that has to contain all the data and code for the system to be able to detect the processor and train the memory to the correct frequency. It would appear that for some motherboard vendors, due to the features in their BIOS, are now running out of space. Because of the age of Bristol Ridge, and the fact that the processors were not widely distributed at retail in the first place, the range of processors seem to be getting the chop from certain motherboard models.